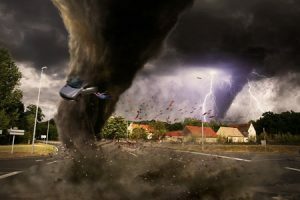 In wake of the recent outbreak of tornadoes in Alabama, it’s important to understand just how devastating natural disasters can be, and how vital emergency storm cleanup services are to the healing process. Multiple violent tornadoes touched down in several Alabama counties. In early March approximately 39 tornadoes hit the deep south in a single weekend. Of those several dozen, two deadly storms ravaged through Alabama within an hour of one another. The rattling effects were widely felt, particularly in the counties of Lee and Macon Alabama, and in parts of Georgia as well. 23 people were killed from ages 6 to 89, and more than 80 people hospitalized. The nearly 70-mile-long path of destruction saw winds of 115 mph. Homes and businesses were destroyed, along with the lives of the people relying on those structures. With destruction to that degree, ensure your residential and commercial properties are taken care of. Many people who haven’t experienced the demolition that comes with natural disaster picture floods of volunteers rushing in to help those affected. Though that’s not entirely untrue, it takes much longer than you might anticipate to handle the physical aftereffects of a storm of that scale. Your business is your livelihood. Your home is your life. Don’t play around with uncertain or unreliable options. Southeast Land Clearing professionals offer timely assistance you can count on. Disaster relief organizations such as FEMA are helpful; however, following a disastrous event like the recent tornadoes they are often overwhelmed with requests for aid. After registering for assistance, you need to wait for a home inspector, and then sometimes several more weeks for funds to arrive—and they may not even cover all the damage. We guarantee that we will evaluate your damage and transform your land in an efficient and timely matter that is personalized to your specific needs. We offer several solutions and have the expertise and resources to execute them, so that we can reassure you your home and business will be taken care of, and you can move forward as quickly as possible. The effects of a tornado, or any disaster of that nature, will impact your life indefinitely. Focus on recovering mentally and physically; let us worry about your property.